September to June, 9 months of the year! These prices are for schoolgroups of 20 or over. Discounts apply for larger groups. Smaller groups may have to pay more. Please check what applies for your group, with Seafriends. We charge parents for the use of snorkel gear but teachers are free. All snorkel equipment is provided: warm full suits, mask and snorkel, fins, masks for short-sighted eyes and if required, also weight belts. In the colder months a hood is also provided. No need for parents to invest. Parents pay for the gear only, at children's prices. Bigger groups enjoy the efficiency of re-using the snorkelgear, resulting in a reduced price. We can handle up to 140 pupils per day (3 groups of 46). The more time you have, the more time we can spend per activity, and the more enjoyment can be had, and the more can be learnt. You learn how the sea differs from the land; how living conditions affect what lives where. You meet many of our common sea creatures and some rare ones. You descend into the miniature world of the rocky shore, appreciating how each creature has adapted to its particular niche. You learn to use mask and snorkel and fins and receive many tips for snorkeldiving. You enter the sea in a warm, protective wetsuit and explore the underwater scene with its many tame fishes but also its many hidden creatures. 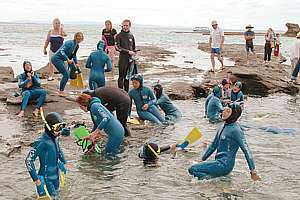 Our snorkel course takes children without prior experience into the water. They don't even need to be able to swim. Our thick full-cover wetsuits keep them warm and provide 4-8 kg of flotation. Children simply cannot drown. Once in the water, the group usually splits up into three: those that are very confident are away first. Those less able stay close to the beach. But within minutes some in the rear-guard gain sufficient confidence to join the lead group. Initiative and inquisitiveness are encouraged. Remember, we are at the beginning of the Goat Island Road but the first snorkel group has priority and must be delivered to the beach first. Buses can turn on our parking place. Keep a tight time schedule. Your bus may be slower than you thought; a child may get sick on the way. Shuttling between beach and Seafriends takes time. Make sure everyone has his swimsuit on and dry undies in his bag, with a towel. A light waterproof raincoat is often desirable. Shoes may get wet. Make sure that everyone joins all activities. No excuses not to go snorkeling! We encourage all parents and teachers to take part. The lunch break can often be taken casually at those activities least pushed for time (video, beach). There are more things to do when you stay here: estuary exploration, night snorkelling, evening lectures, cave exploration, beach walk, coastal walk, dinner party. You can even stay at Seafriends' guest camping. Seated on a grass field, the children hear their names called for the wetsuit allocated to each. After the wetsuit, they all get fitting fins and masks. In colder months an additional hood is worn. Before entering the water, the children receive instruction about how to use the gear, how snorkelling is done, and safety procedures. Each instructor has a float. Children returning after the snorkelling, are often difficult to get out of the water. There is so much to see. 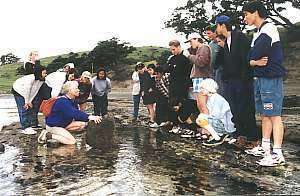 The rocky shore study is conducted by one or more trained instructors per group. Be amazed by what can be discovered during a rocky shore study. A rocky shore lecture can replace the actual shore visit when the tide is unfavourable. The lecture is held at Seafriends Marine Conservation and Education Centre and includes a visit to the aquariums and a short video. Because the aquariums are small, the group is usually divided in two doing alternately the video and aquariums. We've had some problems with discipline in the past. You must realise that the risk of taking children in the water is not overcome by taking X numbers of adults per child. The water is safe under our guidance with one instructor for ten children, and the dangerous spots do not rush out to jump at you! But there are no boundaries in the water. There is no time to explain all the possibilities. Therefore both children and parents must blindly obey instructions. You must make this very clear to your students! ALSO this day can only convey a sense of magic if children are co-operative. We are enthused professionals who wish to inspire those who come here. Often disappointment has been a matter of wrong expectation. For example, groups coming to the beach for Phys-Ed are obviously not in the mood for learning. Those coming for a YAHOO day out, neither. In these cases, don't ask us to run this day for you! Do you really need to bring the disruptive elements in your class? Have they deserved this outing? Determine which days are suitable for you. Remember that for a visit to Seafriends, not only the first and last terms are suitable. The weather and water conditions are good between October and June (terms 4,1,2). As we receive more and more bookings, the favourite months of November and March may be fully booked. Ring us to see which dates are still available. You will also be informed of when low tide occurs. We'll work out a schedule and cost. Then we'll send you an information pack which contains mostly what you can read on this site. We also work out the most favourable cost to you because discounts apply. Once you book a date with us, we'll send you a confirmation pack which contains a contract, to be signed and faxed back to us, and a wetsuit fitting form. At school make some time available to measure all children and participating teachers (and parents if possible) accurately. Wetsuits work only if they fit snugly! So don't disappoint your children when they are about to go into the water with an ill-fitting wetsuit. The Wetsuit Fitting Form is faxed back to us. No need to stress that one group goes onto one page? Leading up to the event, you will be able to prepare the visit by teaching about matters of the sea. On the day before the event, we'll make contact about possible cancellation due to weather or high seas. Bring your payment with you on the day of your visit. After the event you can do all kinds of activities relating to the visit. When well prepared, you can get a very good educational return from your visit to Seafriends. Visit the extensive section about the Goat Island marine reserve, which amounts to a virtual visit with many photos and maps. 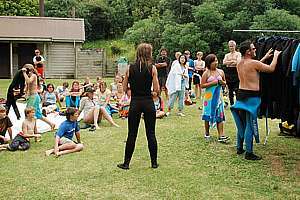 Seafriends was the first to develop snorkelling with schools (since 1992), but as our programmes became more successful, also rogue operators appeared. Such operators work with the barest of equipment and only the slightest concern for the safety and comfort of the children. In the end, what matters is the children's total experience, so let's compare Seafriends with others. Seafriends has a very long safe track record since 1992 and every year we have been working at improvements wherever possible, both in equipment and procedures. Rogue operators do not have the extensive experience with children of all ages in the water. They are also much less familiar with local conditions and where danger can be expected. Their equipment is severely limited. The Seafriends' instructors do not only have the necessary qualifications but they are in addition, trained for the local conditions, the snorkel gear in use, what problems to expect and how to overcome these; how to control groups and how to apply maximal safety; how to attain maximum amazement. Rogue instructors are often 'patched' together to make up the numbers. They are seldom a team which has worked together for a considerable time. They often come from afar. They are not trained for the specifics of the job. Extensive knowledge of the local conditions leads to a safe excursion with the maximum overall experience. Lack of local knowledge may lead to sudden crises, while compromising safety. In addition children do not get the most value. The Seafriends safety suits offer utmost safety and protection while keeping children warm and comfortable. We developed these ourselves and have them made specially for us (a vast investment). Children also get a hood which halves their heat loss and booties when needed. Our thick 5mm unisuits come in 32 different sizes for ages 5 and above, in order to obtain a precise fit. The benefit of our unisuits cannot be overstated. Children simply cannot drown; they feel confident and stay warm, can't get stung or sun-burnt. Rogue operators use cheap, thin suits, often less than 3 mm thick, not providing enough insulation for most months and not enough flotation to be safe. Some even use 'shorties' which is rightout dangerous for inexperienced kids. None provide hoods. Their suits come in only 3-4 sizes, which results in an ill fit for many. They can't dress small children. As a result, children experience severe cold, while their short swim diminishes their overall experience. Slim children are disadvantaged most. Seafriends provides optically corrected masks for the short- and long- sighted (-8.0 to +4.0 diopters) at no additional cost. It was a $8000 investment, appreciated by those who need it. With 6 mask sizes, there is always a mask that fits. None of the rogue operators provide these special masks, which leaves many children unable to see properly, which can only spoil their experience. These operators have one size fits all, resulting in severe discomfort for many. Seafriends has extensive facilities for washing and sterilising gear. At night the gear is forcefully dried to make sure no germs remain alive. Rudimentary sub-standard facilities with a high risk of cross-infection. Seafriends have a classroom for 60-70 with slide- and overhead- projection, and marine ecosystem aquariums. A lecture at Seafriends involves all the above and is inspiring, while attuned to the children's level and interest. Improvements made every year. Rogue operators do not have these facilities, which limits what they can do, and consequently the children's overall experience. Children stay outside in the sun while others do the swimming. 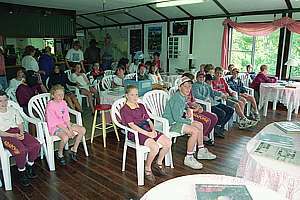 After their snorkel trip, children arrive in the Seafriends classroom where they can warm up. The Centre is also a refuge for a rainy day. On a day visit, children remain outdoors and exposed to the elements and UV. The classroom functions also as an exhibition with many large colourful posters, a sea library, thousands of photos of our seas and preserved specimen. None. The Seafriends' learning experience is backed by a very large web site covering thousands of pages, diagrams and images, all free to use. Over 1.5 million users use it worldwide every year. It required a major effort to create and has become a major resource for schools. None. The fishes of Goat Island, part1 and part2. More to come. None. All Seafriends' profits are ploughed back into conservation, awareness, education; extending its educational web site and doing monitoring and research. Your visit helps saving our seas. Profits are used for personal gain. Matheson's Bay is a protected beach which is often sheltered when Northerlies make suds of Goat Island beach. A small creek runs through the middle of this settlement, flanked by native bush of various habitats and in various stages of human interference. It is a good educational walk, yet short enough to do inside one hour but two hours would be more educational. This coastal walk starts from the beach but does not go round in a loop. The walk contains good samples of coastal forest and good educational value can be found. During a visit to the Reptile Park near Ti Point (5mins drive), many of New Zealand's reptiles (skinks, geckos, etc) can be viewed, as well as tuataras and alligators. Seafriends is all about conservation with common sense, and living sensibly in a sustainable society. We teach our children about the environment we live in, of which we are an inseparable part. Giving our children a sense of awareness of the natural world they live in, is perhaps the first and easiest step towards further exploration and wonderment. Much of what people do and think is in conflict with the concept of lasting sustainability. People have changed the environment beyond what is good for them. And now the environment is changing by itself, without us understanding precisely why. The lectures summarised below are intended to widen our awareness of the world and culture we live in. Eventually these lectures will be presented in full on this site, but for now they exist only in a form that is not suitable for dissemination. Meet the most common fishes of our coast, the ones seen around Goat Island. Learn what is interesting about each. This web site will eventually contain a very complete description and classification of fishes, crustaceans, echinoderms, molluscs, etc. Fish species of the rocky shore. Click on these links to find out what is already there. New YouTube movies Fishes of Goat Island part1 and part2. The conditions for life in the sea change drastically over short distances and with depth. Learn to understand what causes this and how it affects the environment and the creatures living there. Look at biodiversity, marine habitats, biodiversity, rock pool, intertidal rocky shore. Marine conservation is a new concept that we are still struggling with. Learn why it is necessary and what conservational tools we have. Are our marine reserves working? Look at conservation principles, marine conservation, marine reserves, Frequently Asked Questions, Kermadecs, Goat Island, Poor Knights, Rainbow Warrior. New Zealand is not green and clean as widely believed, but is losing its precious resources in an accelerating manner. As we are losing the land, we are also losing the sea and our beaches. How does it all relate and what must we do? Look at the decay section, principles of degradation , NZ shellfish collapse, and the many discoveries made by Seafriends. The earth has had over 4000 million years of evolution. During that time its atmospheric temperature has oscillated. Now, in a period of least CO2, the amount of carbon dioxide in the atmosphere is increasing due to the burning of fossil fuel and other human influences. How would this affect the Earth? What do scientists think about this? Where will it lead to? What does the science say? Look at how the global climate works and why human-made global warming is the biggest scientific fraud ever. Also look and understand the ocean acidification scam. As levels of CO2 in the atmosphere are rising, one fears that the seas are becoming more acidic, with possibly devastating consequences for marine life. But what is the story? What do experiments and biochemistry tell us? Look at acid oceans. What makes New Zealand such a special place? Shouldn't all Kiwis know about this and shouldn't schools devote some attention to this? Special NZ. NZ's special soils and their problems. The Goat Island Camping. Camp sites and backpackers. 300m from beach. Ph 09422 6185. The Whangateau Holiday Park, with caravans, cabins and tenting. 5 km from Seafriends. Ph 09422 6305. The The Barn, backpackers style for 12. 300m from Seafriends. Ph 09422 6123. The Pakiri Surfside Lodge and Motorcamp, 10 km from Seafriends. Tenting for many. Cabins. Ph 09422 6199. Seafriends: we can accommodate small groups as farm-stay, but with all the facilities and comfort. A quiet place. Kohimarama School, Dec 2009: The feedback from Parents and the children regarding our time with you has been incredibly positive. The students had an absolute ball. I have heard several comments that it has been the best school trip they have ever been on. The whole experience was educational, challenging and fun. The children all learnt a great deal about the ocean and how to snorkel. It was challenging, yet managed with the utmost care and safety. Your staff was friendly, professional and always put safety first. They allowed the more confident children to extend themselves and explore the ocean while always ensuring the less confident children had the support and encouragement they needed. Thanks for all your efficient organisation. We hope to see you again in the near future. Auckland Asthma society, Inc, Auckland. We really enjoyed your introduction to underwater life and most of the children rated their day at Goat Island a highlight of camp this year. I especially appreciated your enthusiasm which really got us all off on the right foot and made everyone keen to brave the appalling weather and get into the water to find the fish. The fine cups of coffe were also a winner with the adults, who had been on the 'instant' since the beginning of the week. You certainly cater for all. We look forward to visiting next year and will endeavour to come on the right day! (Karen Falconer) 4 February 1994. Mokoia Intermediate Rotorua. .. The day you spent with us opening doors to the environment around Goat island was totally worthwhile. Students and parents found your lectures, films, aquariums and snorkelling fascinating, informative and entertaining. . . . Personally from my point of view as a teacher, I feel that your enthusiasm and passion for the environment was most refreshing. You related very well to this group and they gained so much out of their time spent with you. Your message is such an important one, hopefully between us we have sparked a few flames for making the changes that are needed for the future. Congratulations on you stand and the efforts you are making to inform people of the plight of the sea. You are an inspiration. . . . (Wayne Howes), 24 December 1998. Many more commendations, withheld for space.